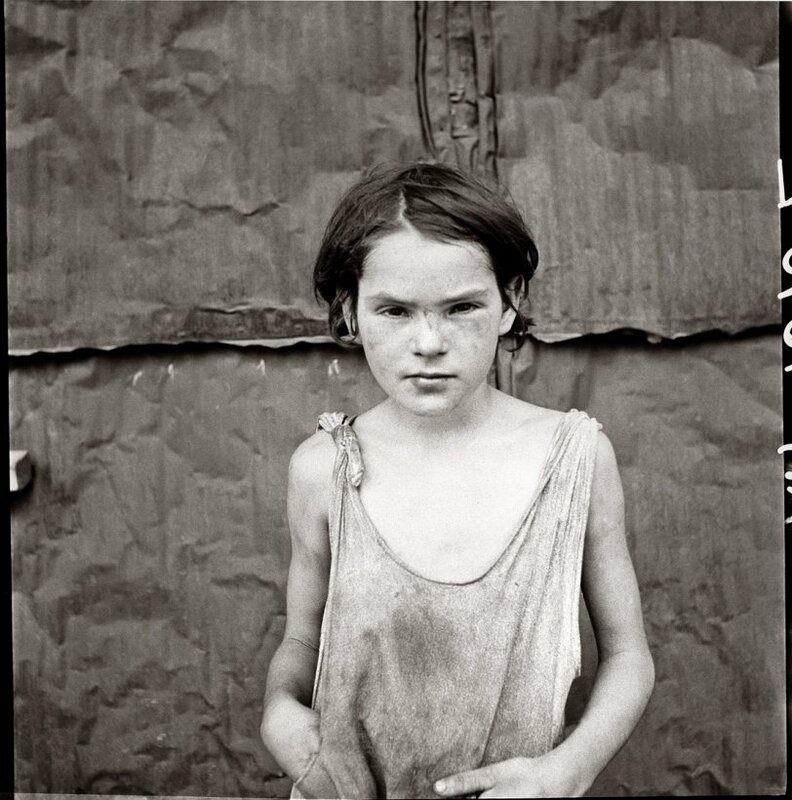 Child living in Oklahoma City shacktown. August 1936. View full size. Farm Security Administration photograph by Dorothea Lange. Submitted by Anonymous Tipster on Sun, 03/20/2011 - 1:05am. I see so much pain in this picture and so little hope; so tragic to think that this kid, or any kid for that matter, lived through all the unspeakable things so plainly seen in this photo. So many layers of scarring if you look close enough. What an incredibly powerful photograph, as are many of Dorothea Lange's. Saw them up close in NYC's MoMA last weekend, and I am very glad I did. If I have any wish for this world it is that we get connected enough to each other that it will be impossible for a kid to be this isolated in poverty and despair ever again. Submitted by Anonymous Tipster on Sat, 10/11/2008 - 12:17am. This portrait is in the "Family of Man" photo book. I've had this book for 40+ years. A lot of photos from the the Depression, including the next photo of this set. One of the books that got me interested in photography. Submitted by Anonymous Tipster on Thu, 07/19/2007 - 7:54pm. So young and you can just tell that she has been through so much. That stare says a lot. Submitted by Anonymous Tipster on Thu, 05/10/2007 - 7:55am. This area used to be the edge of town. It is now exclusive homes, shopping and office buildings. Submitted by Anonymous Tipster on Tue, 05/08/2007 - 11:28pm. Submitted by Dave on Sat, 04/28/2007 - 7:05pm. Good insight. I think German would be sollten. Solten might be Yiddish. Submitted by Anonymous Tipster on Sat, 04/28/2007 - 6:57pm. I think "solten" is German for "[they] should", so presumably "such a serious view of [life], children should laugh". Submitted by Jen on Fri, 04/27/2007 - 7:29pm. Submitted by Anonymous Tipster on Fri, 04/27/2007 - 10:07am. She looks like the actress that played Scout in the movie TO KILL A MOCKINGBIRD. Submitted by Anonymous Tipster on Tue, 04/24/2007 - 12:01am. Submitted by honoba on Mon, 04/23/2007 - 12:08pm.